Spain’s People’s Party (PP) was left embarrassed on Saturday after posting a video on Twitter suggesting it wished Socialist Prime Minister Pedro Sánchez dead, drawing criticism and forcing it to delete the tweet. Furious, the government said in a statement it would take the matter to prosecutors to see if ‘this tweet constitutes an offence and if it does, to move forward with criminal proceedings against the authors and those that publically disseminated it’. The video, posted on the eve of Epiphany – a popular celebration in Spain that sees the Three Kings give presents to children just like Father Christmas – shows a man reading out his son’s wish-list to the Biblical Magi (three kings). ‘My favourite singer was Amy Winehouse, and you took her away,’ the father says in the video, meant to be a humorous sketch, with his son on his knees. ‘My favourite actor was Robin Williams, and you took him away. My favourite comic was Chiquito de la Calzada, and you also took him away. 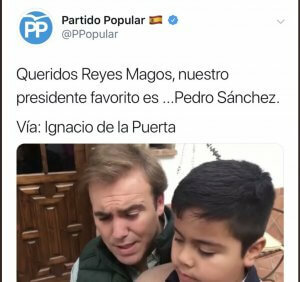 The video caused an outcry amid criticism the PP had gone too far in wishing the death of its arch-rival, prompting the party to delete its tweet and apologise. ‘It was not our intention to offend or wish harm on anyone. It was a mistake,’ it tweeted.